A federal appeals court in California has sided with the Trump administration and authorized the deportation of asylum seekers back to Mexico. The decision is in response to the Trump administration’s emergency motion filing from Thursday asking the U.S. Court of Appeals for the 9th Circuit in San Fransisco to stop a nationwide injunction that would bar them from forcing migrants to wait in Mexico as their asylum cases are processed. Nbcnews.com reports: The court asked that opposition to the emergency motion be filed by Tuesday, 9 a.m. local time. The administration had asked for an administrative stay that would take place immediately and remain in place while the court considers the issue of a longer stay while the appeals process plays out in a possibly months-long process. “We’re very disappointed in the 9th Circuit’s decision and we hope that the stay will be short-lived,” Melissa Crow, senior supervising attorney for the Southern Poverty Law Center, said Friday night. The group is part of the lawsuit seeking to stop the policy. “The plaintiffs and others like them are very vulnerable to harm in Mexico and should be able to pursue their asylum claims in the United States,” she added. The Department of Justice did not immediately respond to a request for comment on the decision. The organizations seeking to stop the policy of returning migrants to Mexico said in a brief earlier Friday that the government’s request should be denied and that there was not “sufficient urgency” to warrant an administrative stay. “The government should not be allowed to manufacture the need for an emergency administrative stay by failing to timely file a stay request,” the brief said. In issuing a preliminary injunction temporarily stopping the policy, Seeborg had ordered that it go into effect Friday to give the administration time to appeal. “It was a huge victory for us and it’s a huge defeat for the Trump administration at least in terms of a signal that you are not above the law,” Rabinovitz said of Seeborg’s ruling. Seeborg also ruled that all 11 migrants named in the lawsuit must be allowed to enter the U.S. within two days of the order taking effect. While the order was not set to officially go into effect until Friday, an official with Mexico’s immigration agency told NBC News the government had not been returning newly arrived migrants to Mexico since the judge issued his decision on Monday. 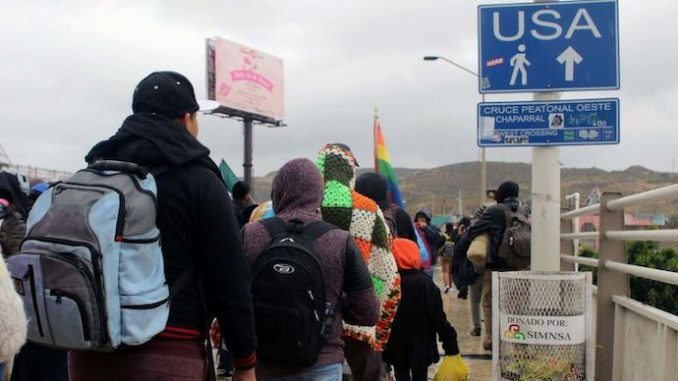 Since the policy was implemented in late January, 1,323 Central American migrants have been returned to Mexico, according to a statement from Mexico’s National Institute of Migration. Of those, 308 were families including 428 children under 18, according to the statement. A Department of Justice official told NBC News that since Seeborg’s order all migrants affected by the policy who have had court dates in the U.S. have been told they will not be returned to Mexico following those hearings. The Department of Homeland Security did not immediately respond to a request for comment. Critics of the policy say forcing migrants to wait in Mexico puts their lives in danger and violates their legal right to seek asylum in the U.S.
Trump administration attorneys have said the policy was meant to deter “baseless” asylum claims that were “overtaxing” the U.S. immigration system. Families seeking asylum had previously been allowed to stay in the U.S., either in detention or released into the country, while awaiting their court hearings. Rabinovitz said that the ACLU would also be working to get relief for migrants affected by the policy whose court dates in the U.S. may not be for months. “Clearly they should benefit even though the preliminary injunction doesn’t order the government to bring them back. They can’t be subjected to this policy anymore so there’s no way they can be required to stay in Mexico,” she said. No, they want, big money for the little elite family.